We have always been firm believers that it is great practice to continue trading even after your classes end, and we’re starting a new program of monthly stock contests to help support that! These contests are open to everyone – just join for free and start trading! You can find the most up-to-date contest information on our Prized Contests page. Here’s now it works – Starting on the first Monday and lasting until the last Friday of every month, everyone who enters will get $100,000 to $1,000,000 to invest in any US stocks or ETFs that they wish. 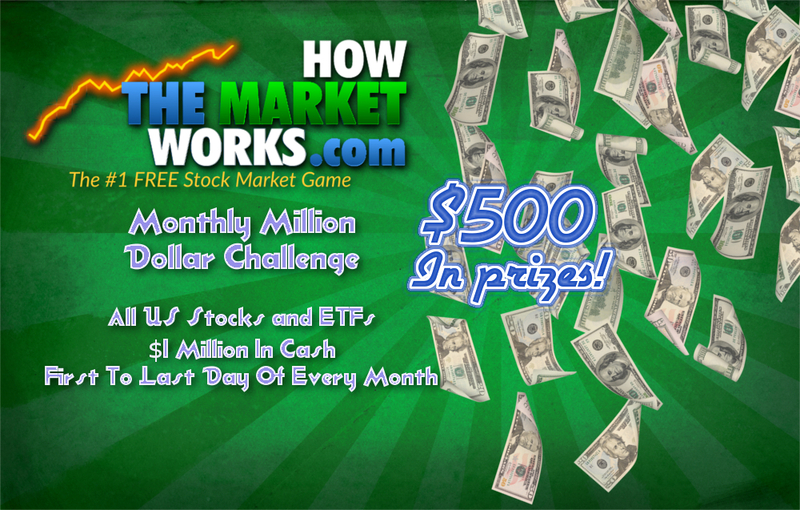 They will compete against other HowTheMarketWorks users and the HowTheMarketWorks team for a shot at $500+ in prizes. The actual prize amount will increase depending on how many people are registering and trading. We might also run shorter or longer contests each month. Students and classes are encouraged to participate, there will be new chances to win every month! These new contests also come with some enhancements to the trading page – now we will be using a slightly different value on the trading page than what we use on your My Portfolio page. The reason for this is that we’re calculating the values for so many accounts at a time – the Rankings page will update a bit more slowly than your Open Positions page. This is to make sure the ranking are always accurate, and the site stays running at peak efficiency. Click Here for the next contest details, and happy trading! As always, we’re putting in place tons of small changes and bug fixes every week on top of our major updates.